On the 30th, we obtained the COD (Commercial Operation Date) at the IS-31 plant in Bladenboro, North Carolina (USA). In order to do this, all the inverters of the plant had to be started up and they had to reach 20% of the nominal power of the plant. 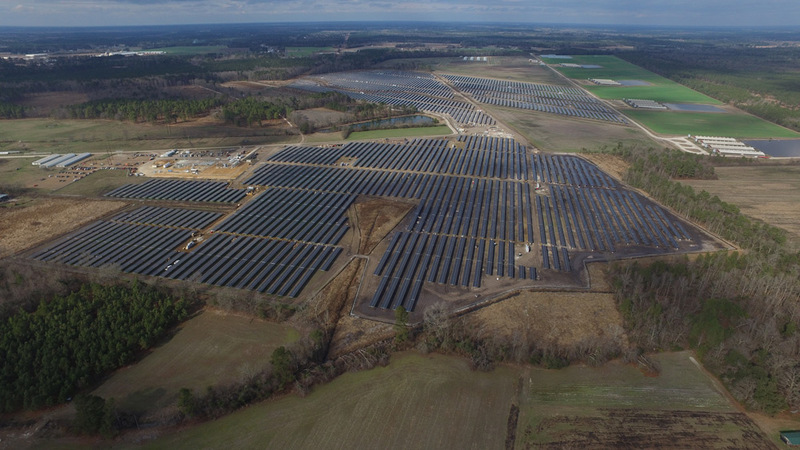 It is the largest solar plant that GRS has built to date, without partners. The plant has 43.12 MWdc and has 127,560 modules, 35 inverters of 1 MW and single-axis tracker. More tan 1600 Monoline trackers have been installed. The construction began on october 2016. An average of 90 electricians have been working every day duing the last three weeks to achieve the boundary post. 13 people from Spain have moved to the plant to help with the start-up and the commissioning in the last two weeks. During the next 3 weeks, all trackers will be set up and the pre-delivery tests will be completed.